Science fiction stories have often shared the opinion that a truly sapient AI would lead to catastrophe for any humans unfortunate enough to have to deal with them. In I Have No Mouth And I Must Scream, Harlan Ellison envisions a powerful AI capable of feeling human emotions, namely rage. This machine known as AM controls what is left of a war-torn planet Earth and tortures what few humans it has deemed worthy of serving as its playthings. In Stanley Kubrick’s 2001: A Space Odyssey, a spaceship computer named HAL grows sapient and takes matters aboard the ship into his own hand, which spells disaster for the human crew. Midboss’ 2064: Read Only Memories chooses to present a different sort of sapient AI to players: one that enjoys learning about plants and watching The Joy of Painting with Bob Ross. In 2064: Read Only Memories (aka ROM), you take on the role of a journalist in 2064 Neo San Francisco whose friend has just mysteriously disappeared. The project he was working on before his disappearance is a blue robot named Turing, who claims to be the world’s first truly sapient AI. Together with Turing and a host of other characters, you seek the truth behind your friend’s disappearance and uncover a conspiracy that threatens the very foundation of Neo San Francisco. Taking inspiration from Hideo Kojima’s cult classic sci-fi game Snatcher, ROM is a point and click/visual novel hybrid presented in 32-bit graphics. By using the analog stick you can highlight different objects or people on the screen, and you’re given the options to look at, interact with, talk to, or use an item on each object or person (the game allows you to talk to almost everything and get a unique response even if it’s something you normally wouldn’t talk to). Of course, the quality of any game in this genre hinges on the writing, and ROM is a brilliant mixture of comical buddy cop antics and grand sci-fi drama. The story takes you all over the city, exploring everything from its busiest public areas to its seedy underbelly. The writers made sure to include more detail than necessary into the game to give it an authentic sci-fi feel. You can often speak with Turing to learn about this wacky cyberpunk society you live in greater detail – from human augmentation to the privatization of public services, ROM considers almost every aspect of a city that embraces the latest in technological advances regardless of consequences and the results are fascinating. The superb writing also extends to the game’s cast. Characters such as Jill, the Neo San Francisco cop that used to date your sister, are dynamic and multilayered. She struggles constantly with the balance between assisting you in your rogue investigation to bring the truth to light, following the rules, and keeping you out of harm’s way lest your sister find out. She’s witty and cynical, but caring as well. Others such as TOMCAT and Jess are equally as interesting, and just when you think you’ve completely figured them out, another secret is exposed. The game is also fully voice acted, which really brings things to life. The voices are very high quality, with performances by voice actors such as Erin Yvette and Jim Sterling’s giving characters more depth with their unique accents and line delivery. ROM’s music is excellent and easily one of the biggest highlights 2064 has to offer. The soundtrack covers a variety of different genres and almost every song is catchy enough that I found myself humming one or another while playing without even realizing it. The game gives you the option of using the pair of headphones in your inventory to listen to any song you’ve listened to previously, which is a nice option given how good the music is. While great, ROM does have its fair share of issues. Its puzzles interspersed throughout the adventure are handled poorly. They usually take only a few minutes to solve, but they’re more often than not rudimentary or just plain boring. Honestly, the game would be much better off having all the puzzles left out. They add nothing to the experience and only serve to slow things down. Characters can also be a bit too chatty – that may seem like a silly complaint for a game that’s all about dialogue, but sometimes characters (especially Turing) can spend a bit too long discussing one topic, or essentially repeat what they just said again, slowing down the game further. 2064: Read Only Memories Integral presents itself as the ultimate version of ROM by providing a variety of extras. These include a 55 page digital art book, a sound test, character profiles, previously unreleased videos from the development team and a new 25 minute side story called Punks. While Punks serves as a fun little post story to the main game, it’s too short to serve as a reason to buy the game if you already own it. Still, Integral on Switch is the only way to play ROM portably with all its features (Type-M for mobile devices lacks voice acting of any kind), so if you have to have ROM on the go this is the version to get. 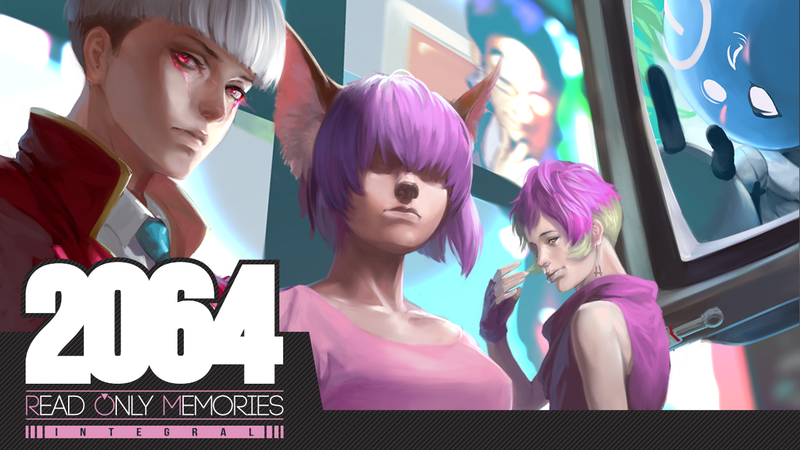 2064: Read Only Memories Integral is a smart and interesting sci-fi detective story that introduces players to a cast of well-realized denizens of a cyberpunk society. The spectacular visuals, music, and voice acting make this an experience any visual novel enthusiast should give a look. Poorly designed puzzles and some unnecessarily long conversations serve to slow down the game’s pacing, but overall this is one future worth visiting.